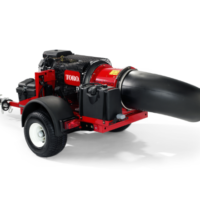 The lastest Toro leaf blower is now one of the most powerful and effective Leaf Blower available in the UK. If you are a professional Groundman, Golf Course Green Keeper, Sport Stadium Manager, Estate & Schools Manager then this is the ideal and most effecient machine on the market. Recently supplied to Market Harborough Golf Club & Northampton Golf Club. See this in action on our video page.